City Across The River is an interactive reading experience I created with Twine. The story is based on a feature length movie script I wrote back in college. Though the script itself is not that great anymore in my much grown eyes, I still find the story interesting. I decided to use parts of the script, break them up into tiny little pieces and interconnect them in Twine to create a story web with no ending. This story consists of fragments from a 90-minute movie script from 2011 by an unknown writer. Most of the script was destroyed in a flood. The following are the only legible passages recovered from the script. With missing content and the absence of page numbers, it is up to you to figure out what the story is about. Choices you make will take you to related scenes. As shown in the structure diagram above, the way the story pieces are connected is loosely hierarchical. Lower level story blocks can be looped back to higher level blocks by choice. There is no ending to this story. 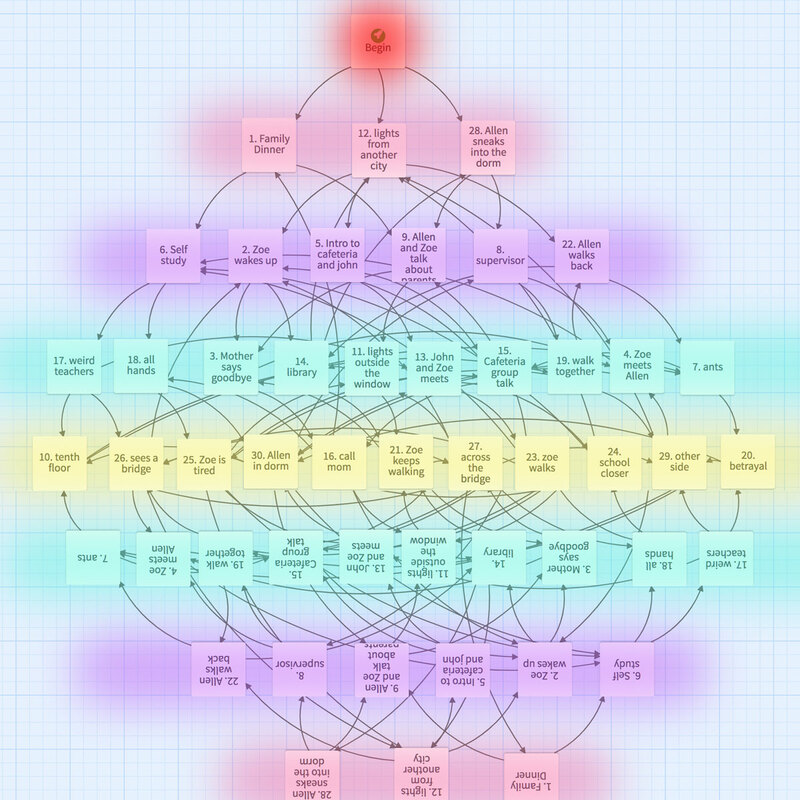 Once the reader gets to the fourth level (colored yellow), they will be directed back to the other levels (colored blue, purple and red), lost in the narrative and running in circles.